Clinical legal education emerged in the United States in the 1960s to give valuable skill-based instructions to law students while providing legal services to people who could not otherwise afford them. 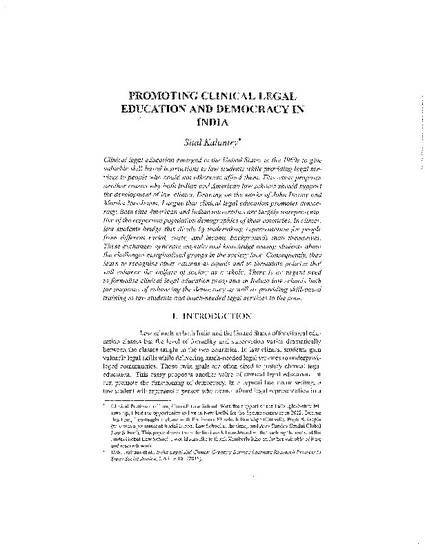 This essay proposes another reason why both Indian and American law schools should support the development of law clinics. Drawing on the works of John Dewey and Martha Nussbaum, I argue that clinical legal education promotes democracy. Both elite American and Indian universities are largely unrepresentative of the respective population demographics of their countries. In clinics, law students bridge this divide by undertaking representation for people from different racial, caste, and income backgrounds than themselves. These exchanges generate empathy and knowledge among students about the challenges marginalized groups in the society face. Consequently, they learn to recognize other citizens as equals and to formulate policies that will enhance the welfare of society as a whole. There is an urgent need to formalize clinical legal education programs in Indian law schools both for purposes of enhancing the democracy as well as providing skill-based training to law students and much-needed legal services to the poor.